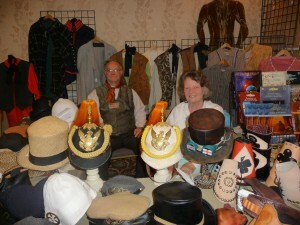 How does one describe the Oklahoma Steampunk Exposition? It was fast paced, confused, hectic, but a whole lot of fun! It was confusing as the guest list changed radically during the last two weeks due to unforeseen financial problems that caused most of the plane tickets for top name celebrities flying in to be canceled. In addition to that, while the online schedule was freely available, the actual printed program didn’t show until partway through the second day, and even then, it was difficult to find out for certain who had canceled and who was still appearing. The schedule was further moved around simply because we were all having too much fun to go to bed on time, so bleary eyed people were still just waking up around the time the first programming was scheduled. Kali’s Hourglass was ready to perform at 10 am on both Saturday and Sunday, but was asked to move it back 1 hour both days due to lack of audience awake enough on Saturday and the failure of the hotel to provide a projector on time on Sunday. In spite of this sort of thing, most people really enjoyed themselves, which in the end, is what this type of event is all about! The Hellblinki Sextet performed Friday Evening to an enthusiastic crowd. As they often offer a fusion of jazz, rock, and experimental music, crowd reaction was varied in some areas, but overall extremely positive. Honestly, if you don’t get a few people with a “deer in the headlights look” saying something like “I’m still trying to figure out how much I liked it, because it was so unusual, but it was certainly very interesting”, then you have no business really calling it “experimental music”. They did not disappoint! As such, they made an excellent addition to this year’s lineup! Performances included an excellent set by “Unwoman” who provided hauntingly beautiful melodies and songs both at 3pm (when Psych Corporation was supposed to have performed) and again at 4 pm on Saturday. Her show was very well attended and appreciated, that is until the costume contest began at 4 pm, drawing away most of the attendees. The contest was very popular and had some excellent ensembles as you can see from some of the Flikr site photos, but the scheduling opposite a major concert was unfortunate timing. 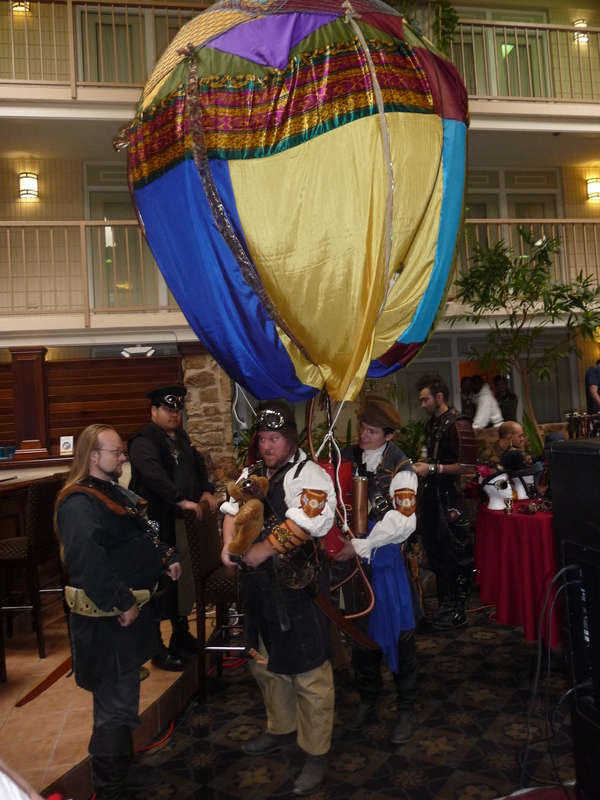 Panels by Airship Isabella included an excellent demonstration and explanation of various modified or “from scratch” Steampunk weapons and gadgets with a guest speaker Steve Liptak (from Airship Nocturne) joining them at their request. They not only demonstrated their greatest creations, but also gave away secrets about how these marvels were created on a budget! 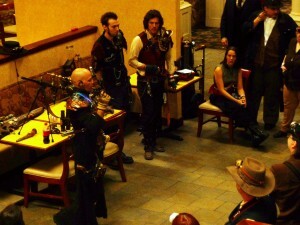 They also gave a panel explaining their form of Steampunk performance art, their projects, and their involvement in the community. Naturally their high quality offerings in their vending and display booth were very popular as well. 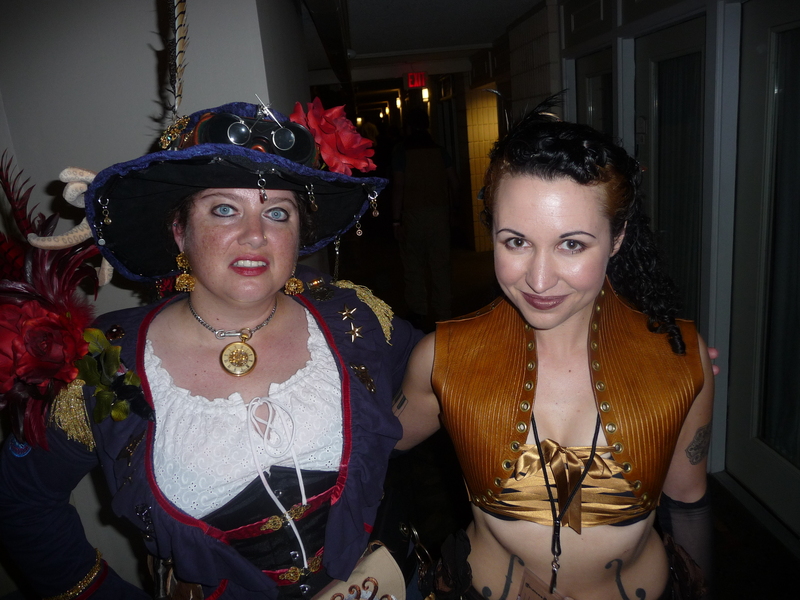 Panels from Kali’s Hourglass included “Steampunk Fashion Alchemy”, “Multicultural Steampunk Ensembles”, and “Nickel Children”. 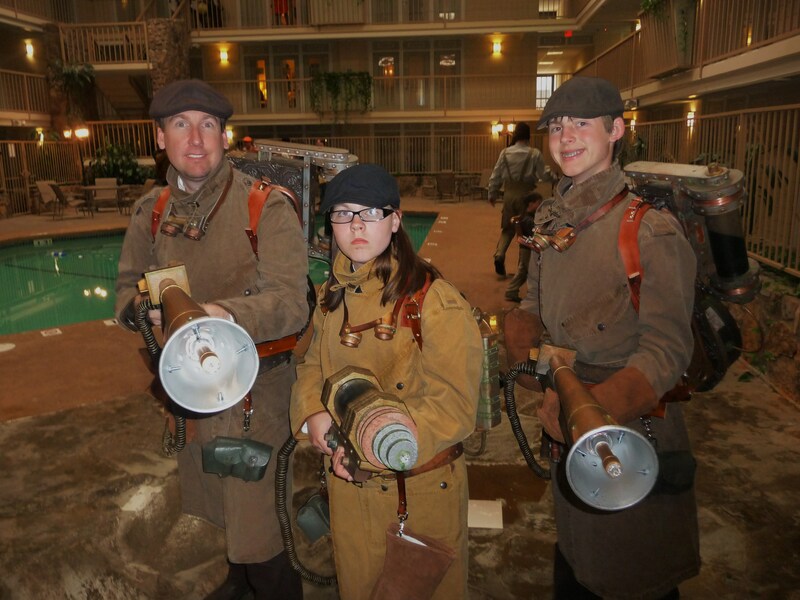 The first panel taught a variety of ways to increase or decrease the size of garments while making them much more “Steampunk” in the process as well as how to make interesting and useful weapons and accessories on a very limited budget from almost any sort of junk or left overs. The second actually taught about the vast array of “Steampunk” ensemble options and sub-genres that are now popular, yet are quite different from the original Victorian Eurocentric designs people often think of as “Steampunk”. It also gave a brief explanation of various controversies and ways to overcome them regarding the use of styles inspired by cultures from around the world. This focused mostly on pointing out that culture is everything and that culture is primarily learned rather than born into a person. They also encouraged members of the community to really study cultures to learn how to best honor them, rather than simply borrow from them in ways that might be seen by some as disrespectful if done in a careless manner. The third panel presented the award winning Steampunk Western short film “Nickel Children” and answered questions about it’s creation, purpose, and impact on the Steampunk community and the world today. Other performers included a great variety of sideshow performers, many Bulrlesque Dancers, comedic swordsmanship presentations from the four man team of team of “Cut, Thrust, And, Run” (those are also their stage names), and truly excellent announcing and MC services provided by one “Peter Pixie”. (I’ve never actually thought to mention the MC before, but this man is truly exceptionally helpful to the show in all respects!) While this reporter was unable to see some of the sideshow acts perform sword swallowing and other harrowing feats, one really stood out called “Naughty Bits”. While they did much less in the way of sword swallowing, self piercing, blockhead etc. types of acts than some others, they were charming and incredibly funny! 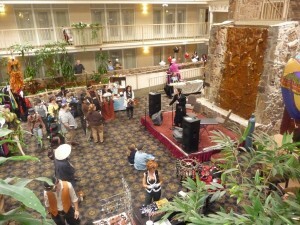 The dance on Saturday night was popular with new wave dance music from DJ Bone. About a dozen dancers were very heavy into the dance with others watching them. One of the Sideshow performers started giving rapid hula hoop displays in the audience area. He was good at this, but the room was just too small for this as he almost hit people several times and ran into a lamp overhead repeatedly. The room would probably seat less than 100 max normally, so it just wasn’t really big enough for a dance, but would have worked without the high speed (looked almost like a kung fu demo) hula hoop swinging out around him about 6 feet in all directions. That venue size limitation and the lack of any staff present to question high risk behaviors, were the only real problem with the dance, so it was generally a big success. The venue was lovely, but seriously contributed to the problems the event faced. The hotel ignored their contract mandate to provide a projector, and one panel was finally forced to show their film on a wide screen TV. Their desk staff and registration system took around 10 to 15 minutes per person just to check in. There was even a rather serious problem with the food service director who told one couple to leave his restaurant (or be removed by security) for complaining about cold waffles. A bystander reported that the couple had been “excessively rude” about the manner in which they complained, but the waffles really were ice cold, and they didn’t curse or use any language that would have gotten them thrown out of any other restaurant under the circumstances. 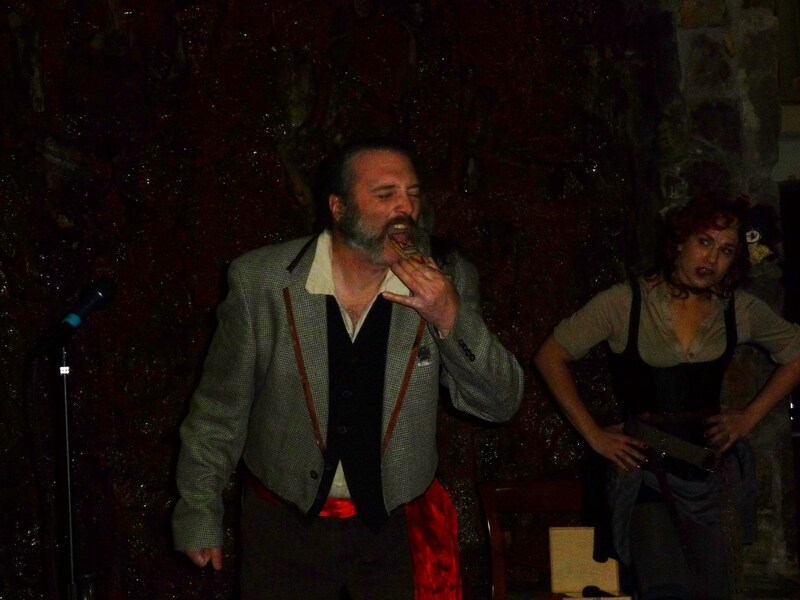 There was a small, medium, and large panel room, but the large one usually was set aside for performances such as burlesque dancers and the Saturday night dance. This worked fairly well, but was hard to find without a map or a program, and the professional LARP team never really got a decent place to teach their LARP, so it got talked about, but not really offered as promised. The costume contest had to be held in a public area surrounding the indoor pool. That worked out better than expected, but as mentioned before, made excluding outside hotel guests impossible. The Burlesque show was pretty good by reports, but crowded and hard to see as the dancers were given no stage of any kind, and they obviously could not do burlesque in the main atrium room of the hotel which is where the only stage was set up. 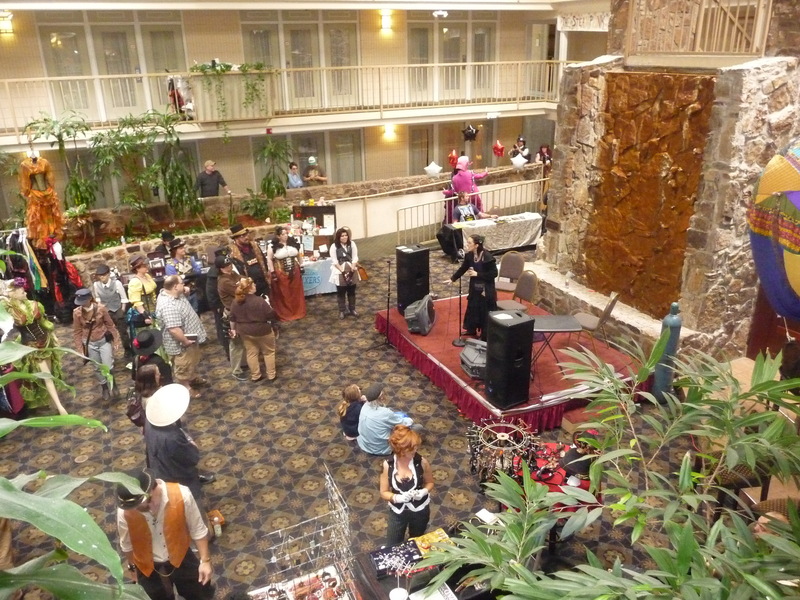 The main convention area was shared by all the normal hotel guests as it was situated with the main stage in the central building atrium (most rooms in the hotel opened directly on to the balconies above this area and all guests had to walk through it to access the restaurant). 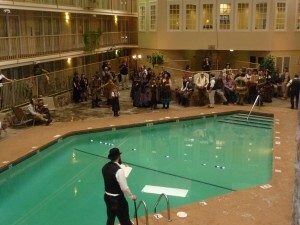 To make things worse they were forced to put one large panel in the restaurant, and two of the contests in the hotel pool area, so it was impossible to restrict anyone from the event. The main stage could even be viewed best from the balconies surrounding the central atrium above it which had complete free access as it was actually the hallway in front of most of the hotel’s rooms. The main stage was so small that musicians found it difficult to use, and it was raised only 1 foot, so audience often had to get to a balcony for a good view. In addition the room was only around 100 seats in size (plus standing room in the balcony/hallways above) and much of that was taken up by vendors around the edges, so seats were rarely used. While there was enough room for the audience, they all had to stand for most performances which was a problem after hours of walking and standing between events. Vendor selling actual brass gears!!! Financially, the event probably suffered a lot due to problems with the venue and lack of security. They had only one visible security volunteer (that this reporter saw anyway) at the entire event. He was courteous and effective, but rarely left the vendor room. As such it is likely that many of the guests never paid. This may have contributed to poor pre-registration sales, which when combined with rumored problems with the hotel, may account for some of the inability to pay for plane fares, but then most first run events don’t invite so much out of town talent for exactly that reason. The Program Director (also Co-Chair) specifically stated that they plan to use a different venue for next year and to adjust as needed to avoid similar problems next year in other areas. In spite of everything, the volunteer staff and the performers banded together to put on a great show, and make it a really fun event for those that attended. That may well make up for this year’s limitations enough to bring a much larger crowd back next year. Woot we got called professional “and the professional LARP team never really got a decent place to teach their LARP, so it got talked about, but not really offered as promised.” We were sorely disappointed that after a setting up a beautiful place for Steampunk Europa, patiently handling constant changes to where were being put and finally losing our room completely on Friday night that we still had people intersted. Luckily despite the super tiny space we had on Saturday Night we had a great play test and hope to bring more Steampunk Europa to the masses. 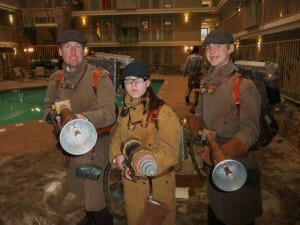 If anyone is interested in learning about Steampunk Europa check out our facebook and look for us at Comicpalooza and GlitchCon. Thank you Admiral for you kind words. It was a pleasure meeting you and your crew! I hope to see you all real soon. – Peter Pixie. My humblest apologies Ms. Trent. If you managed to get a decent play test, then I was given bad information by the event staff. 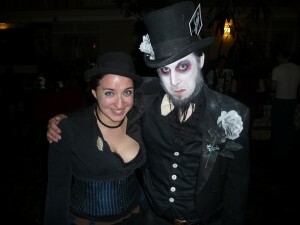 I asked around a lot, because I was personally extremely interested in seeing your LARP, but between my various roles as performer, promoter (of Nickel children, not the OK Steampunk Expo) and as journalist, it was difficult to locate you and play your game, but believe me I really tried. You did indeed get moved multiple times. It appeared you did get the chance to at least explain the game well on Friday, but I was disappointed when told it would not happen on Saturday. I am so pleased to hear that information was incorrect and that, like so many others, you rose above the difficult situation and made good things happen. I’ll be in touch as I still want to hear more about the game and how the playtest went. 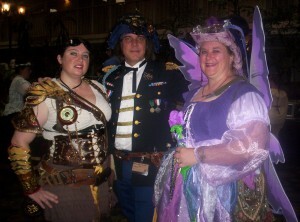 Cheryl, my friend was at the LARP and said it was great despite the setbacks. He’s super critical too which means it must have been amazing. This was my first Steampunk convention. I had always been a fan of the genre and some of the works that I’ve seen around the internet but had never really gotten into the community. This was my first experience, and one that has now gotten me entirely into the Steampunk way. I have met some amazing people (including Cherie Priest, who’s simply an awesome author). 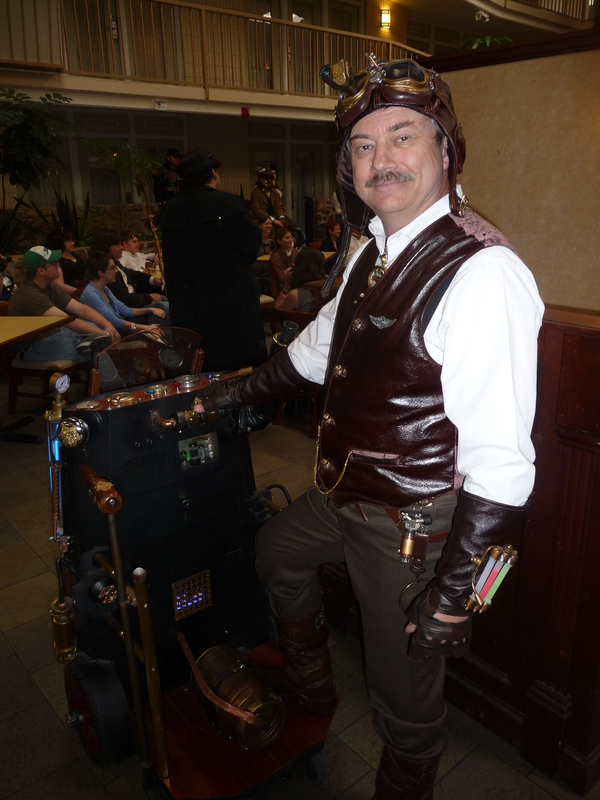 Since the OSE has concluded, I’ve now formed the Oklahoma Steampunk Group on facebook which has now expanded to 36 members. Thank you everyone who put on the show and helped the Community in Oklahoma(and in Kansas, as that community also started to grow after the OSE) expand! Lovely pic of me with the mousetrap on m’tongue! Glad you got to catch the act! Apart from the confusion inherent in a first year event, we had a blast performing at the Expo! You folks in attendance made it a fantastic time (And we were some of the folks wandering around until the wee hours…The most interesting people always seem to be met after 4 am!) and I wouldn’t trade a second of it! We are already planning on coming back again next year. Nice, well written and honest review. It is appreciated! Being sorely disappointed with the way venues tend to treat events such as this, I am in the beginning stages of developing a perminant rennfaire type spot outside of the OKC area, somewhat like that which you find in Muskogee, except I want to open it up to steampunk events as well as highland games, etc. Still being new to steampunk (mostly jewelry and small aesthetics)any input and ideas will be most appreciated.